I'm going to attend the hearing in person and will report on it in due course. I have a hunch that the courtroom is going to be crowded. it was indeed issued on Tuesday -- the day that Deutsche Presse-Agentur (dpa) reported on it. "The request for injunction was filed with no notice to Samsung, and the order was issued without any hearing or presentation of evidence from Samsung." While it's true that they weren't put on notice and that there wasn't any hearing, Samsung wasn't forthright enough to admit that it had filed a protective pleading. Samsung wasn't blindsided -- Samsung knew it had this coming, and the court's decision was based on both Apple's motion and Samsung's pre-emptive opposition pleading. This kind of communication strategy on Samsung's part is old-school spin doctoring and only serves to strengthen my impression that Samsung is in a legally weak position against Apple. If Samsung wants to inspire confidence, it has to understand that half the truth is sometimes tantamount to a whole lie. The court's press release stresses that the court did take Samsung's protective pleading into account when it decided on Apple's motion. 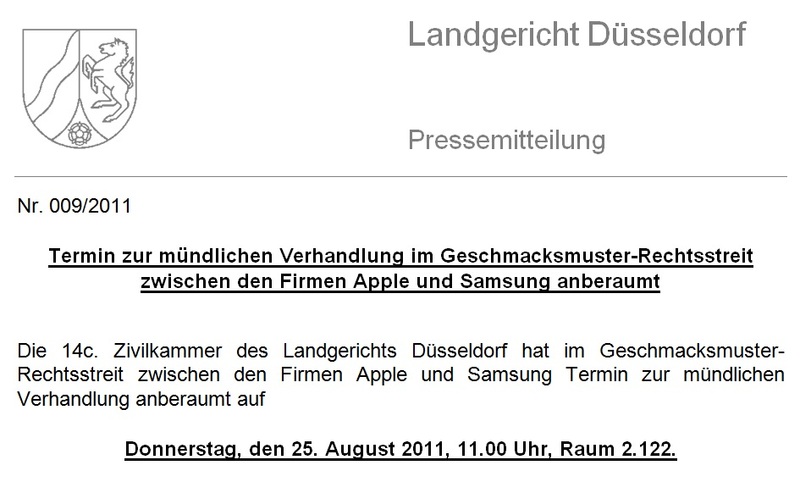 However, German courts usually don't provide a reasoning along with decisions on preliminary injunctions, which is why one can only guess why the court wasn't swayed by Samsung's protective pleading. Samsung argued that there wasn't a sense of urgency that would justify a preliminary injunction. However, there can hardly be a more urgent situation for such a decision than the launch phase of a new, allegedly infringing, product. Under German law, no one asks the question of whether equitable relief (meaning a damages award) is a sufficient remedy for an infringement. Under German law, an infringement is not tolerated, period. Against that background, I'm not surprised that Samsung wasn't able to convince the court of a lack of urgency. Samsung furthermore argued that it was "preparing" a petition to have Apple's asserted Community design invalidated. As I reported yesterday, a small company named JAY-tech is already working on that, too. After the injunction was issued Samsung filed its opposition. The court's press release says that Samsung plans to provide a more detailed opposition brief until the hearing on August 25. Given that Samsung already failed with its protective pleading, its lawyers will now have to come up with some new arguments to have the motion lifted. Usually such hearings only lead to a different outcome if the defendant can prove that the plaintiff's representations were factually wrong, which I doubt in this case. 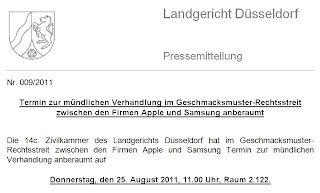 It's far more likely that the district court is just going to affirm its decision, and in that case, Samsung will probably try to appeal the preliminary injunction to the second-instance court (Oberlandesgericht Düsseldorf). In parallel, the first-instance court will continue with the main proceeding, which will probably take about a year.